The Australian PGA Championship offers a huge opportunity for Australian players but it’s not just the young guys eyeing off a European Tour card. Co-sanctioned by the European Tour and the ISPS HANDA PGA Tour of Australasia for a second year a win at the Australian PGA Championship will see the champion earn full status in Europe until the end of the 2018 season. It’s a dangling carrot for many up and coming Australian Tour Professionals but also for some of our most experienced. With no status on the PGA TOUR in 2017, Robert Allenby says the opportunity to compete on the European Tour is one he is taking seriously. Allenby launched his career in Europe, notching up four victories between 1992 and 1994, before heading to the United States where he has also won four titles. “I am already thinking about playing some tournaments over there. Being a four time past champion I think I still get some status and I have always paid my membership up each year. 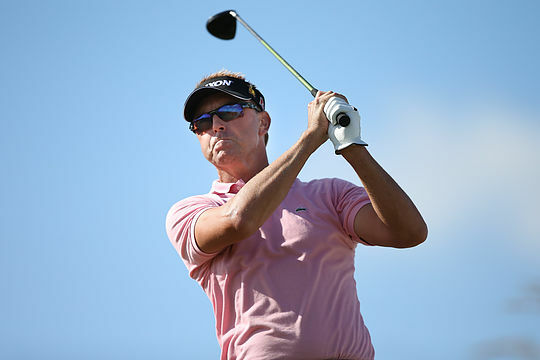 I have never really let go of the European Tour,” said Allenby. “I think after the Australian PGA Championship it’s a matter of summing it all up and seeing where I am at and what is going to be best for me. “Obviously I live in Florida, playing the PGA TOUR is the number one thing for me. If that’s not an option, I have full Web.com status but I don’t know if I want to play the Web.com Tour. While Allenby will be doing his best to win the Australian PGA Championship to be played from 1-4 December at RACV Royal Pines Resort on the Gold Coast he says he would also like to see one of the young players on Tour walk away with the win and a ticket to Europe. “For the Australian Tour to co-sanction with the European Tour is a really good thing for our Tour and for the young guys who need somewhere to go and play,” added Allenby, with 2015 Australian PGA Champion Nathan Holman already reaping the benefits of the co-sanctioning. A win at the Australian PGA Championship isn’t the only goal for Allenby this summer; he is also hoping to win the ISPS HANDA PGA Tour of Australasia Order of Merit. After finishing T12 at the Fiji International and picking up a cheque of $22,725, Allenby is almost $200,000 behind current leader and 2016 New Zealand Open Champion Matthew Griffin. Allenby would likely need to win at least one of the remaining tournaments this season to have a hope of achieving that feat. “I would like to win the Order of Merit again. By doing that you get into The Open, two World Championship events and a bunch of other tournaments on the PGA TOUR,” added Allenby.